Straw Bans are a waste. Plastic straw hysteria is in the air. 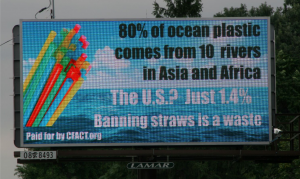 CFACT put up a billboard on the highest traffic intersection in Lancaster, Pennsylvania that confronts the hysteria with the facts. Plastic straw bans have been put in place in Miami Beach, Malibu and Seattle. New York City, San Francisco, Portland, Oregon and others are poised to follow suit. Private companies are succumbing to the pressure and getting on board. Starbucks famously announced that it would replace straws with a new plastic lid that it turns out actually uses more plastic than the straws it is designed to replace! Plastic in the ocean is a problem. The good news? The problem isn't you.